Dual purpose marine batteries perform the function of both traditional deep cycle and starting batteries. This feature is useful in fishing boats, as many accessories and electronics are traditionally run off the starting battery. AGM (absorbed glass mat) style batteries is a unique glass mat that is built to wick the electrolyte between the plates. These batteries contain a small amount of liquid, just enough to moisten the mat so nothing can break or leak out. This method makes these types of batteries durable, stable, and able to handle many charge and discharge cycles. 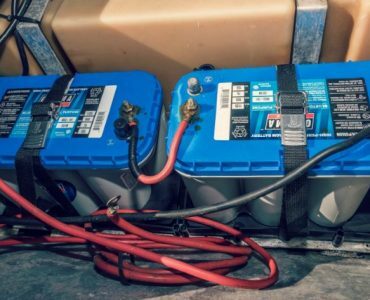 These types of batteries are expected to have the power to start the outboard engine and the juice to power the electronics over the course of a full day of fishing. Dual purpose AGM solve this problem of cranking power and deep cycle power draws. Marine Battery Group Size – Pay attention to the physical size of the battery. You should check the group size and make sure it fits in your battery tray or compartment. Not every size is going to work for each application due to weight as well. Some people do not mind carrying a 75-pound battery if it provides the necessary power. Others might prefer a battery that is smaller but still gets the job done. 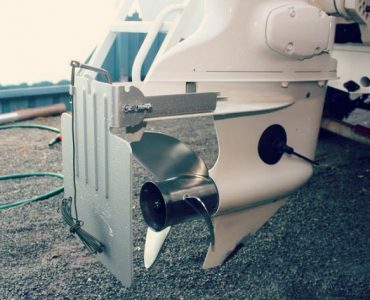 Cold Cranking Amps (CCA) – This factor is the number of amps provided to “turn over” the outboard engine. It’s important to consider this because the size of your engine is going to determine the battery that you need to get it started. Get a battery that has too low CCA, and you will struggle to turn it over, especially after it has been drawn down during the day. Marine Cranking Amps (MCA) – MCA is the same as CCA but measured in a different way. CCA is measured at 0 degrees F, while MCA is measured at 32F. Reserve Capacity – This is what provides the current draw to the accessories and electronics. It’s the number of minutes a battery can run before falling below the minimum voltage. AGM Only – Most dual purpose marine batteries are the sealed AGM style. Many Lead Acid marine batteries simply cannot provide the necessary CCA and deep cycling ability needed for large motors and electronics. Charging – Like all marine batteries, Dual Purpose AGM will require proper charging for long life and performance. Make sure the charger for your boat has AGM charging capability. The Odyssey Extreme Series are some of the very best dual purpose marine batteries you can buy. The price tag is high, but no other AGM has better specs or as good a warranty. The 31M model especially offers excellent reserve power of 205 minutes and capacity rating of 100 Ah. That is more than enough to power a fishing boat with several large fish finders, plus the livewells all day. Even the smaller 27M matches up favorably to the Optima 31M specification wise. The 1150 cold cranking amps are enough to crank the bigger 200-250hp outboards found on top of the line bass boats. Motor manufacturers have been putting a higher emphasis on CCA requirements for their outboards in recent years. Bottom line, if you need the best AGM battery to power everything on your fishing boat, the Odyssey 31M is our Editor’s Choice. Optima Blue Top is a popular and high-performance AGM battery with a powerful runtime and above average recharges. 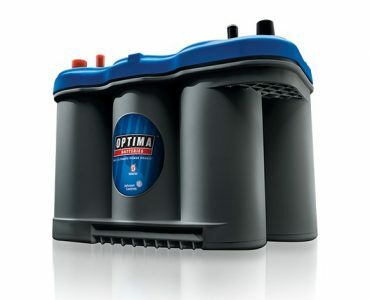 Pros: The Optima Bluetop is one of the best dual purpose marine batteries. The Optima advantage against the competition is its ability to take more recharges than most other marine batteries. This feature results in better runtime and longer lifespan. The Optima batteries are also very durable and good resistance to vibration during tough boating conditions. The AGM design makes these batteries fifteen times more resistant to vibrations which keeps the battery safe and makes for a longer lifespan. Since these have the AGM design, they are capable of being stored for extended periods of time without needing much attention, other than occasional maintenance charging. Thanks to the sturdy and secure design of the batteries, this makes them spill-proof and mountable in any position. Optima guarantees you will not have a spill with their batteries. Cons: For the price of these batteries, there are few bad things you can say about this battery lineup. The only thing is sometimes Optima has shipping issues. Shipments of batteries occasionally fall behind, and batteries have gotten damaged during the shipping process. Just keep this in mind and maybe voice your concern to the manufacturer when you order a battery online. 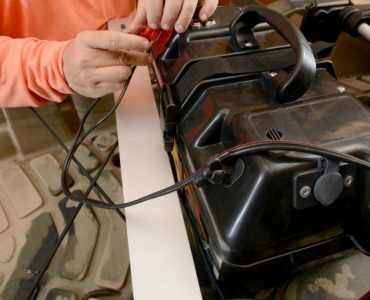 This battery from Northstar is excellent for high-performance fishing boats. This pure lead AGM battery is made in the USA and features a very high reserve, Amp-Hour capacity, and cold cranking amps for large outboards. Pros: When compared to some other batteries of the same price and quality the Northstar has a faster recharge. This one has gotten tested against a few other batteries and nine times out of ten the Northstar AGM charges to 100% faster than the competitors. Cons: The only notable downside of this battery is the size. The typical battery was weighing between 75-100 lbs. These are heavy batteries, but they are durable and offer a lot of power, so it’s a trade-off. Trojan Batteries are known well for their sustained performance over the long-term. The company has a long history of producing quality batteries. Trojan also implements a variety of eco-friendly features into their batteries. Pros: Trojan batteries contain a high-density paste formula that is designed specifically for high-performance batteries. This design was created perfectly for the Trojan lineup and as a result, produces top of the line batteries that outperform their competitors. Trojans grid technology provides a structurally sound battery that reduces the risk of corrosion and deterioration of parts. The AGM design of these batteries offers a longer run time than most of their competitors and lowers the operating costs associated with the battery. 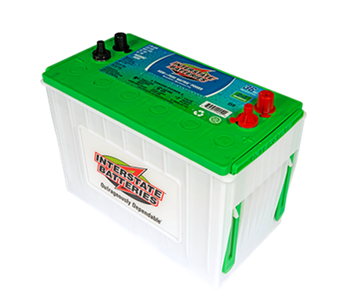 Interstate has some of the best marine dual-purpose batteries on the market. Interstate is a reputable company with a long history of producing quality batteries for any of your “toys”. This AGM battery is especially popular in fishing boats and for a good reason. This Interstate battery offers a lot of power and cranking amps in the most popular marine sizes. Pros: The marketing term for Interstates AGM battery design is called “Pure Matrix.” The company says that their batteries have the power of two in one. The battery serves as a cranking battery and for running power when the engine is off. Due to the “Pure Matrix” design, the batteries have a lot of power, and the company claims their service life is twice as long as a typical AGM battery, and three times in comparison to a flooded battery. If something does go wrong, the company offers a solid three-year, total replacement warranty. The structure of the battery is sturdy, vibration resistant, and corrosion resistant. Cons: Put up with some other batteries of the same quality and this Interstate AGM is a little bulkier than more, more difficult to install, and it has a pretty hefty price tag. All in all, it is a high-quality battery. When deciding on a battery for yourself, make sure you consider the things from the beginning of the article. Choosing the right battery for your situation is essential. 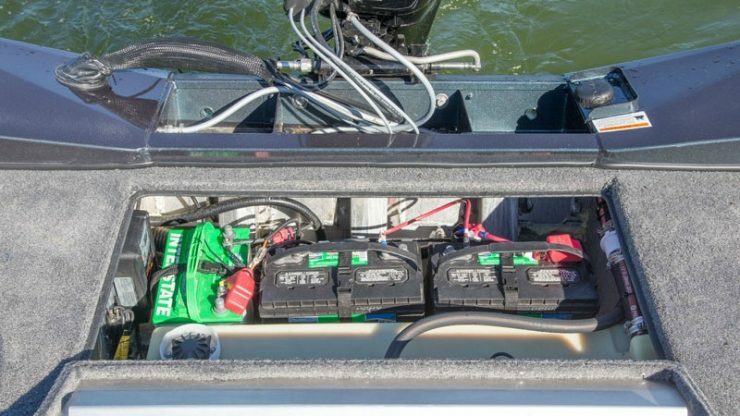 Every boat and every angler have different needs when it comes to batteries. In the end, the Odyssey 31M Trolling Thunder is one of the best dual-purpose AGM marine batteries. This battery has a rigid and robust design that is perfect for bass boats and freshwater fishing. The company offers a reliable warranty even though the batteries should typically last years longer than that. Alternatively, Optima Blue Top batteries can be readily found in a lot of different places whether it be online or in the store. There is a wide variety of marine batteries from Optima, all of them have the AGM design that makes them leak proof and maintenance free. If you are an avid fisherman and you need a battery that is going to hold up during inclement weather and stay good through the offseason, take a look at Optima’s line of batteries.